In a lawsuit filed in New York, the Securities and Exchange Commission brought civil fraud charges against six former executives at the two firms, which have become symbols of the economic collapse. 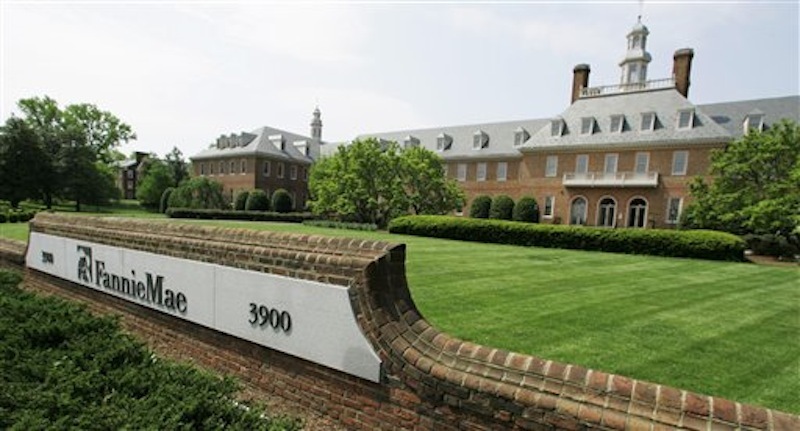 WASHINGTON — Two former CEOs at mortgage giants Fannie Mae and Freddie Mac on Friday became the highest-profile individuals to be charged in connection with the 2008 financial crisis. Khuzami noted that huge losses on their subprime loans eventually pushed the two companies to the brink of failure and forced the government to take them over. The charges brought Friday follow widespread criticism of federal authorities for not holding top executives accountable for the recklessness that triggered the 2008 crisis. Before the SEC announced the charges, it reached an agreement not to charge Fannie and Freddie. The companies, which the government took over in 2008, also agreed to cooperate with the SEC in the cases against the former executives. The Justice Department began investigating the two firms three years ago. In August, Freddie said Justice informed the company that its probe had ended. Mudd, 53, and Syron, 68, led the mortgage giants in 2007, when home prices began to collapse. The four other top executives also worked for the companies during that time. In a statement from his attorney, Mudd said the government reviewed and approved all the company’s financial disclosures. Syron’s lawyers said the term “subprime had no uniform definition in the market” at that time. According to the lawsuit, Fannie and Freddie misrepresented their exposure to subprime loans in reports, speeches and congressional testimony. Fannie told investors in 2007 that it had roughly $4.8 billion worth of subprime loans on its books, or just 0.2 percent of its portfolio. That same year, Mudd told two congressional panels that Fannie’s subprime loans represented didn’t exceed 2.5 percent of its business. The SEC says Fannie actually had about $43 billion worth of products targeted to borrowers with weak credit, or 11 percent of its holdings. Freddie told investors in late 2006 that it held between $2 billion and $6 billion of subprime mortgages on its books. And Syron, in a 2007 speech, said Freddie had “basically no subprime exposure,” according to the suit. The SEC says its holdings were actually closer to $141 billion, or 10 percent of its portfolio in 2006, and $244 billion, or 14 percent, by 2008. During the financial crisis, the two firms verged on collapse. The Bush administration seized control of them in September 2008. So far, the companies have cost taxpayers more than $150 billion — the largest bailout of the financial crisis. They could cost up to $259 billion, according to their government regulator, the Federal Housing Finance Administration. Mudd was paid more than $10 million in salary and bonuses in 2007, according to company statements. He was fired from Fannie after the government took over. He’s now the chief executive of the New York hedge fund Fortress Investment Group. Syron made more than $18 million in 2007, according to company statements. His compensation increased $4 million from 2006 because of bonuses he received — part of them for encouraging risky subprime lending, according to company filings. It’s not clear what portion of the bonuses was for his efforts to promote subprime lending. Syron resigned from Freddie in 2008. He’s now an adjunct professor and trustee at Boston College. The other executives charged were Fannie’s Enrico Dallavecchia, 50, a former chief risk officer, and Thomas Lund, 53, a former executive vice president; and Freddie’s Patricia Cook, 58, a former executive vice president and chief business officer, and Donald Bisenius, 53, a former senior vice president. Lund’s lawyer, Michael Levy, said in a statement that Lund “did not mislead anyone.” Lawyers for the other defendants declined to comment Friday. Based on the outcomes of similar cases, the lawsuit might not yield much in penalties against the former executives. In July, Citigroup paid just $75 million to settle similar civil charges with the SEC. Its chief financial officer and head of investor relations were accused of failing to disclose more than $50 billion worth of potential losses from subprime mortgages. The two executives charged paid $100,000 and $80,000 in civil penalties. Fines against executives charged in SEC civil cases can reach up to $150,000 per violation. SEC Chairman Mary Schapiro has asked Congress to raise the limit to $1 million. Goldman Sachs & Co., for example, agreed last year to pay $550 million to settle charges of misleading buyers of a complex mortgage investment. JPMorgan Chase & Co. resolved similar charges in June and paid $153.6 million. Citigroup Inc. agreed to pay $285 million to settle similar charges, though that settlement was recently struck down by a federal judge in New York City. Associated Press writers Marcy Gordon in Washington and Larry Neumeister in New York contributed to this report.